Four Seward baseball players are ready to take the next step. Four Saints signed with four year programs Wednesday afternoon in the All American Room at SCCC/ATS. 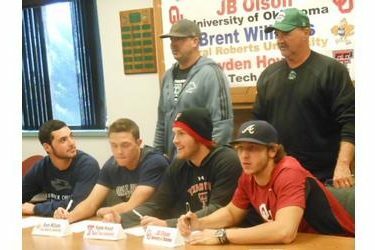 Outfielder Brandon Urquizo signed at Lubbock Christian, catcher Brent Williams inked with Oral Roberts, pitchers Hayden Howard (LHP), and JB Olson (RHP) signed with Texas Tech and Oklahoma respectively. Williams selects ORU after a record setting season at Seward. The Colorado Springs catcher hit .415 with seven homers, 69 RBI’s, and an NJCAA record setting 37 doubles. Urquizo picks LCU after hitting .376 with two homers and 31 RBI’s. The Vernon, Texas outfielder whacked 13 doubles and legged out two triples. Olson chooses the Sooners after a going 7-3 with a save, 78 strikeouts, and 10 walks with a 2.02 ERA for the Saints. The right hander from Plano, Texas also pitched for the Bee Jays this summer logging a 3-3 record with a 2.85 ERA. Hayden Howard returns to Seward for the spring of 2015 after one redshirt season at Texas A&M. Howard was 8-3 with a save, a 1.69 ERA, 65 K’s, and 33 walks during the 2013 season at Seward. The Carrolton, Texas lefty picks the Texas Tech Red Raiders who made the College World Series last season. The Saints open January 31 at home against McCook.